No fans of snow, Jake, Hope and Windy prefer dry ground. With about 4 inches of snow and single-digit temperatures, the furkids aren’t too thrilled with going outside to take care of their business. Shoveling the steps, ramp and a potty path are not enough. Carrying Jake and Windy outside the door and chasing Hope outside are parts of their morning routines. Once outside I watch them. After they finish their jobs, I lavish praise on them. Reinforcing housetraining during horrible weather is essential. This keeps us from having to do multiple clean-ups, even though we have potty pads in place. However, I think my neighbors are questioning my sanity when they hear, “Goood girrrrrl,” “Way to go Jake,” and “What wonderful dogs!” several times a day. 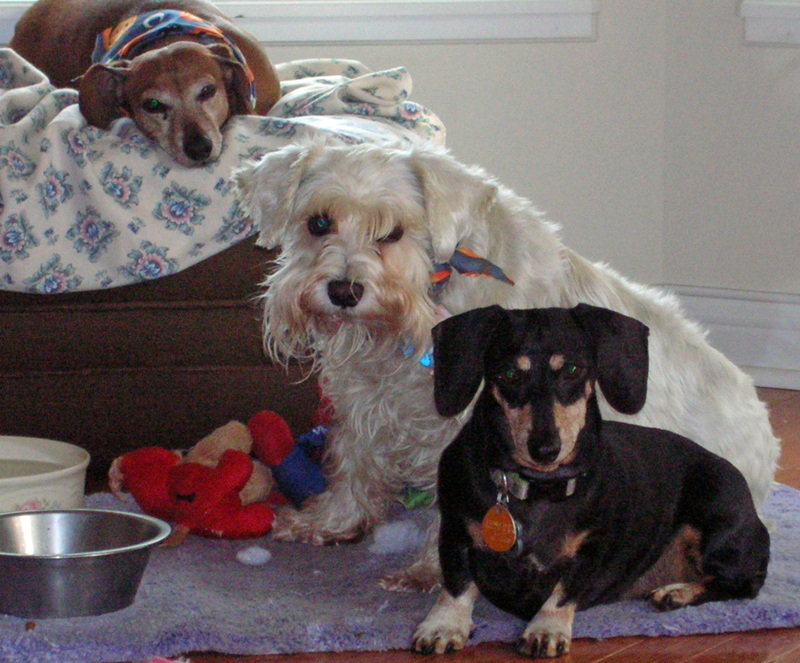 This entry was posted in Dachshunds, Dog Behavior, Schnauzers, Waste Management and tagged Dachshunds, Dog Behavior, Housetraining Pads, Schnauzers, Snow, Winter. Bookmark the permalink. A friend invented the “Poop Tent.” You put up this pup tent (pun intended) before a storm so that there is a protected area. Dogs will then have no trouble finding a comfortable spot, although you may still have to shovel out the path to this area. These items are now manufactured in China and should be available on upper class web sites soon. I have to look for this. Thanks!